Trees are one of our city’s most important—and overlooked—assets. Trees give us shade, coolness and oxygen. Trees provide habitat, remove pollution from the air, reduce runoff, mitigate against climate change and provide other health, economic and aesthetic benefits. Trees are also at risk—from development and infill, threats such as the emerald ash borer, and challenging growing conditions. Local groups and individuals are working in various ways to draw attention to the importance of trees and encourage protection and sustainable management of the urban canopy. They include Tree Ottawa, Hidden Harvest Ottawa, Champlain Oaks, Big Trees of Kitchissippi, South March Highlands and others. A new group, Tree Fest Ottawa, is using images and stories to inspire people to protect trees. 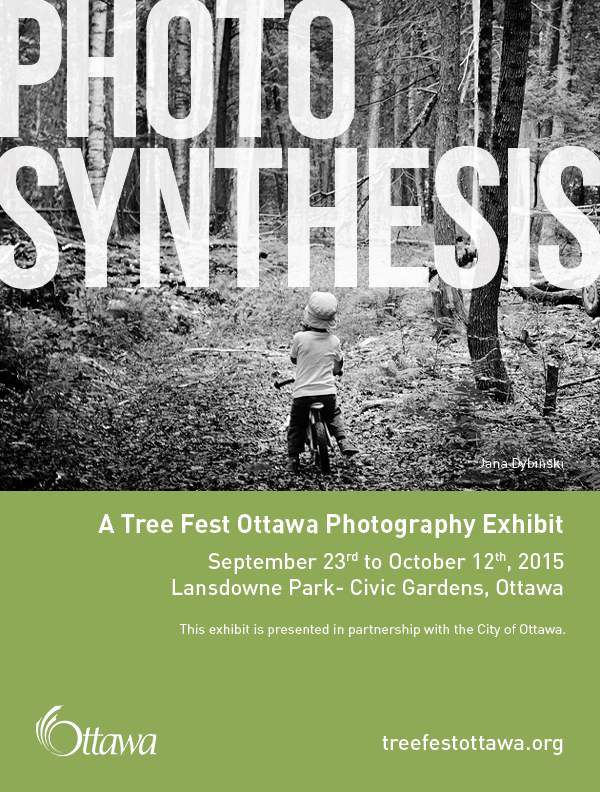 Their first exhibition, PhotoSynthesis, launches on Wednesday, Sept. 23, 2015 at a Tree Day event at Lansdowne Park. The free outdoor exhibit presents the work of local photographers and profiles local tree specialists, including a botanist, a forester, foragers and a violin maker. It runs until Oct. 12.
an evening of short films and talks, Trees for Life, on Tuesday, Oct. 6, co-hosted with Forests Without Borders, in the Horticulture Building at Lansdowne Park, from 6:30-9 p.m. The evening features botanist and author Diana Beresford-Kroeger, as well as the films Forest Man, The Man Who Planted Trees and Moving Forest. Be sure to check out Tree Fest Ottawa’s website for more information on the interesting things they’re doing. Also on Wednesday, Sept. 23, 2015—National Tree Day—the City of Ottawa is hosting Urban Trees: Putting Down Roots for the Future. It’s a discussion about trees and a launch of the city’s initiative to develop a comprehensive Urban Forest Management Plan. The event is 6-8 p.m. at the Horticulture Building in Lansdowne Park. Speakers include Philip van Wassenaer, arborist and urban forestry consultant. Details and registration here. It’s an opportunity to learn more about the city’s plans, and to meet some of the groups involved in protecting and celebrating Ottawa’s tree canopy.